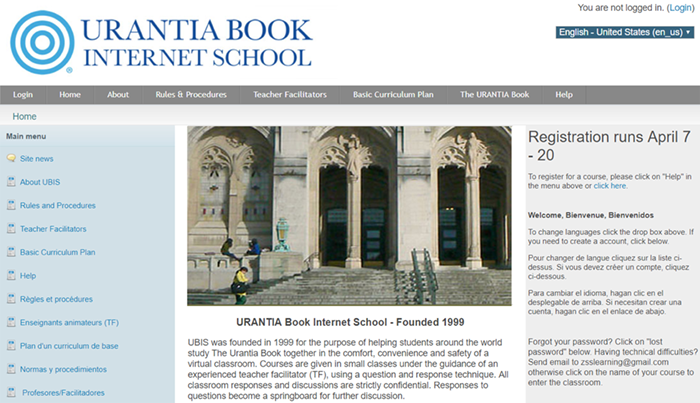 Urantia Book Internet School (UBIS) enjoyed its twentieth anniversary this past year. From humble beginnings as an email correspondence school, back when the Internet was still considered fairly advanced technology, UBIS has grown into and out of a series of websites. 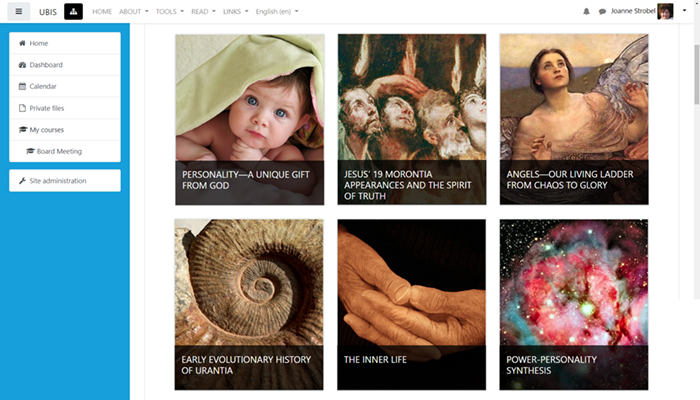 The newest one, a major upgrade from our previous site, uses a platform called Moodle. 1. To dawdle aimlessly, to idle time away. 2. The process of lazily meandering through something, doing things as it occurs. 3. An enjoyable tinkering that may lead to insight and creativity. While the true etymology is unknown, there are instances of prior usage, both attributed to George Bernard Shaw. In 1921 he wrote, “That old one who saw you out of your shell has gone off to moodle about doing nothing” (Back to Methuselah, p. 251). Far from aimless, Moodle is an example of a Learning Management System, or LMS, which delivers and manages all types of content such as courses, documents, and video. In the area of higher education, platforms like Moodle offer colleges and universities a variety of distance learning functions that not only fit the teaching philosophy of UBIS, namely, facilitated self-learning, but also offer a discussion forum, and the ability to gather statistics and analyze performance. In the spirit of definition number three, students and teacher-facilitators are able to access virtual classrooms at their leisure, with no prescribed meeting times. Courses follow a weekly format, allowing for plenty of time to read the assigned Urantia Book papers and respond to several thought-provoking questions. Alternate weeks are spent sharing insights, discussing various interpretations of facts, meanings, and values, and getting to know their fellow agondonters. But I digress. For the past year we had discussed the possibility of a fresher look for UBIS. Even though the desire for an upgrade was driven by appearance, there were also important technical factors to consider, including better support for today’s mobile phones and tablets. While most of us in the United States enjoy reliable and high-speed Internet service, that is not always the case in other countries. For this reason many of our international students take courses using smartphones instead of a computer. Although Moodle had released a number of new versions since we first began using it in 2014, Michael Zehr, our UBIS web administrator, soon realized that Moodle is not known for ease of upgrade. This presented a choice: continue to try to change and modify our current system, or undertake the major task of a full upgrade. We began the summer hiatus attempting the former. But it became increasingly clear that the newer tools we needed, including mobile responsiveness and multi-language capability, were simply not compatible with our five-year-old version of Moodle. The decision was made to proceed with a full upgrade. So next we needed to find a trained Moodle programmer. We began searching on a site called Upwork. There we found Goldie Jordan, a young lady who works as an LMS Technical Analyst at Southern University–Baton Rouge (SUBR), in the Division of Information Technology. Goldie was also a freelance web designer with a passion for coding and design. She declared herself to be efficient and speedy, which was important since by this point we had only four weeks left until September registration opened. She also had the necessary skills to describe to a layperson like me exactly what was involved. Do we refashion the current suit of clothing or do we tailor-make brand-new, couture attire? Not only did she advise us to do the latter, we also needed a new mannequin to wear the clothes (Joanne-speak for a new server). She hit the ground running, scrutinizing the former site to make note of current customizations. She performed the initial server setups, recommended and installed the latest Moodle version, and transferred data from the old server to the new. All of the student profiles, including course history, were maintained and migrated. As that progressed, our small team of three worked diligently to complete the configuration. Michael couldn't simply copy and paste text from the old site, so entirely new programming was required. Once the style of the new clothes, or “theme,” was selected, work began in earnest to configure, customize, and translate the site into French, Spanish, and Portuguese. The new and improved UBIS makeover debuted on Monday, September 16, opening day of the 2018–2019 academic year. By Wednesday, 300 users had logged in and more than 150 requests for course enrollment had been registered. Thirteen courses in three languages are currently being offered on a site that now looks attractive, modern, and user friendly, and which accommodates phones and tablets as well as computers. Best of all, we now have two separate sites, a “testing” site for Michael to try out future upgrades and the actual “production” site where he implements those changes. We went from drab . . .
UBIS new front page. Scrolling front page pictures can be changed at will. Our Moodle site looks better than ever, students and teacher-facilitators are thrilled, and the UBIS board can relax in knowing that our site should function beautifully for the next six years!